Due to the variable ratio between the spandrel and vision glass, Eensulate will match any existing façade design (where there are no constraints on original architecture) as well as new buildings. Furthermore, Eensulateis expected to allow for fast retrofitting due to its characteristics, which would minimize the disruption of business and impact on occupants. The innovation potential and market competitive advantage lies in the combination of three different material innovations in a single product platform, scalable from Basic to Premium. Eensulate components will make use as much as possible of existing components such as frames, structural silicon, gaskets, etc. ), although some kind of adaptation will certainly be require. EENSULATE project aims to develop innovative lightweight (35% weight reduction compared to the current best performing modules), highly insulating energy efficientcomponents as well as associated enabling materials for cost-effective retrofitting and new construction of curtain wall facades. 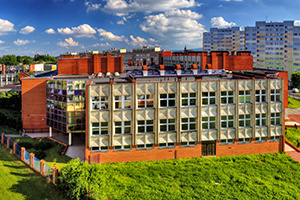 Eensulate represents an ambitious project, which aims to introduce a novel unitized curtain wall system capable of meeting the market demand.It is expected to be an affordable(28% reduction of total refurbishment costs), high performance prefabricated façade retrofitting solution with reduced weight and thickness. It aims to bring existing curtain wall buildings to “nearly zero energy” standards, reducing energy bills by at least 20% while complying with the structural limits of the original building structure and national building codes. 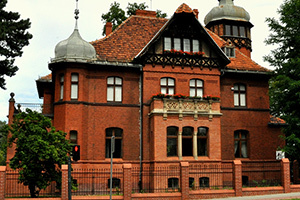 Due to the variable ratio between the spandrel and vision glass,Eensulate will match any existing façade design (where there are no constraints on original architecture) as well as new buildings. Furthermore,Eensulateis expected to allow for fast retrofitting due to its characteristics, which would minimize the disruption of business and impact on occupants. The innovation potential and market competitive advantage lies in the combination of three different material innovations in a single product platform, scalable from Basic to Premium. Eensulate components will make use as much as possible of existing components such as frames, structural silicon, gaskets, etc. ), although some kind of adaptation will certainly be require. The project output is a product family that will be promotedin two different levels of performance. 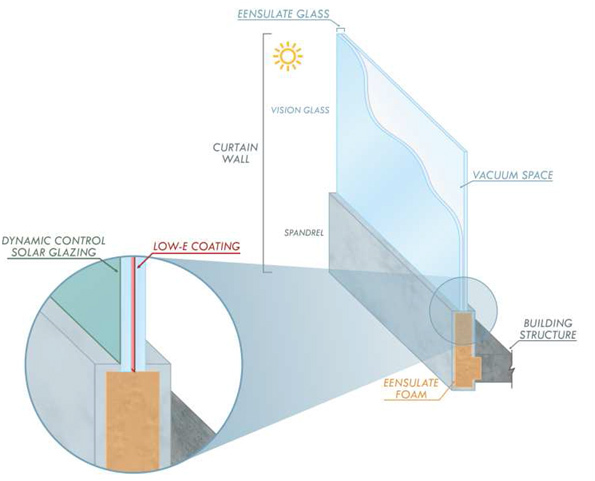 First, Eensulate Basic expects to tackle both the vision glass and spandrel, and drastically reduces thermal bridges associated with interfaces between the spandrel and the sub-structure. Second, Eensulate Premium expects to add, through thermo tuneable coating, the dynamic solar control behaviour in a cost-effective way and integrate multi-functionalities as self-cleaning and anti-fogging properties. During the installation of these products, special spray foam – Eensulate spray foam – is used to increase insulation of the building. Thermal and acoustic insulation will be provided by the novel VIG and “smart foam” in the spandrel combined with state of the art low-E coated glass. Multifunctionality by integrating novel thermo-chromic coated glass with additional self-cleaning and anti-fogging properties. Eensulate is expected to be an affordable (28% reduction of total costs) and lightweight (35% weight reduction) solution for envelope insulation to bring existing curtain wall buildings to “nearly zero energy” standards, while complying with the structural limits of the original building structure and national building codes. Highly insulating mono-component and environmentally friendly spray foam for the cost-effectiveautomated manufacturing and insulation of the opaque components of curtain walls as well as for thesignificant reduction of thermal bridges during installation. 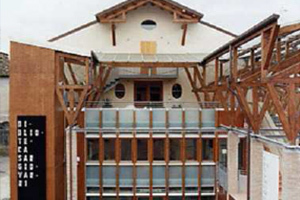 Lightweight and thin double pane vacuum glass for the insulation of the transparent component of curtain walls, manufactured through an innovative low temperature process using polymeric flexible adhesives and distributed getter technology, thus allowing to use both annealed and tempered glass (including laminated safety glass) as well as low emissivity coatings (1% emissivity). A multifunctional thermo tuneable coating will allow for dynamic solar gain control as well as anti-fogging and self-cleaning properties. Develop a commercialization Strategy and associated Business Plan with potential economic benefits assuming mature market costs. Continuously updating the business plan, including more detailed marker research based on market segmentation, analytically define competitive technologies, arranging price policies and marketing strategies.